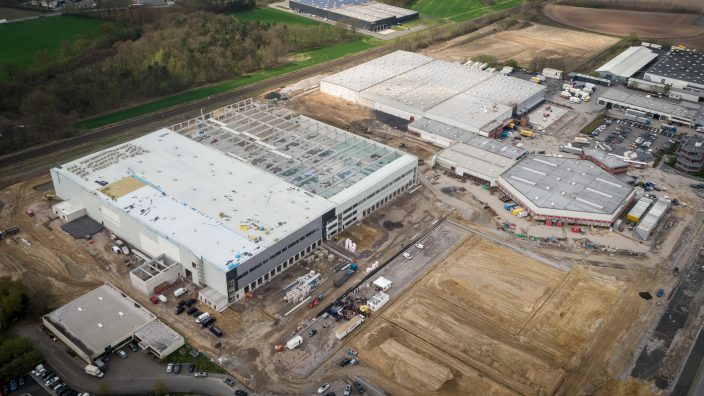 Legen den Grundstein für das neue Logistikzentrum in Greven: (v.l.) Jens Fiege, Betriebsrat Mensud Gößling, Landrat Dr. Klaus Effing, Bürgermeister Peter Vennemeyer, Thomas Heinicke, Logistikleiter MediaMarktSaturn und Felix Fiege. 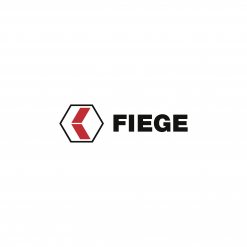 The logistics centre is being built at the home base of the Fiege Group. 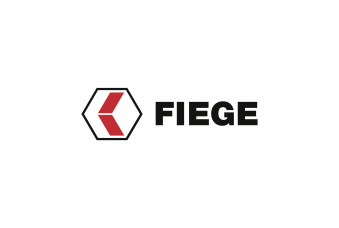 200 invitees, partners, Fiege employees and the Fiege family attended the laying of the foundation stone on Monday, 16th April 2018. 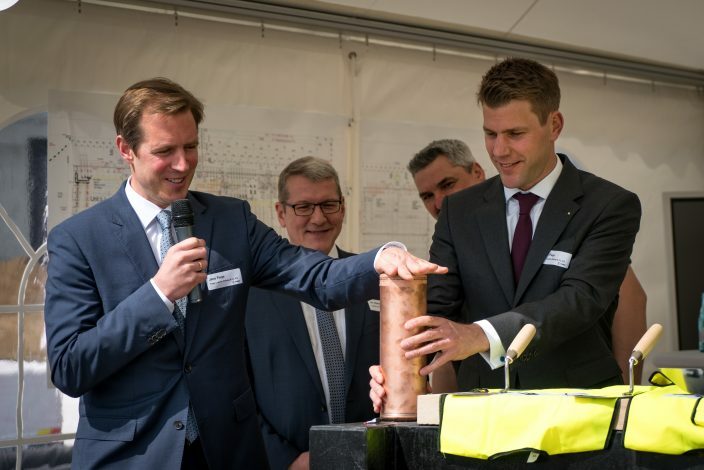 Thomas, Heinicke, head of MediaMarktSaturn logistics in Germany (2nd from right) and the head of the district authority, Dr. Klaus Effing (2nd from left) fill the time capsule. 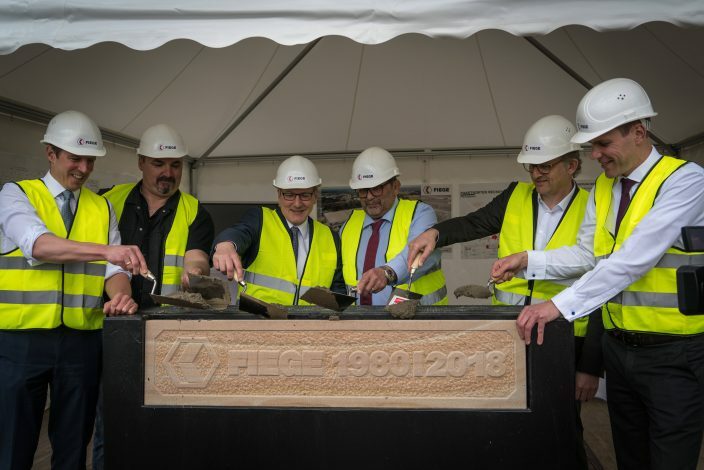 Jens Fiege (left) and Felix Fiege seal the time capsule before it is buried in the foundation stone with a current edition of a daily newspaper, a copy of the Fiege magazine, LOGO, the building’s blueprints, and a few coins inside. The sandstone seals the time capsule tightly in the foundation stone. Greven, 17th April 2018. 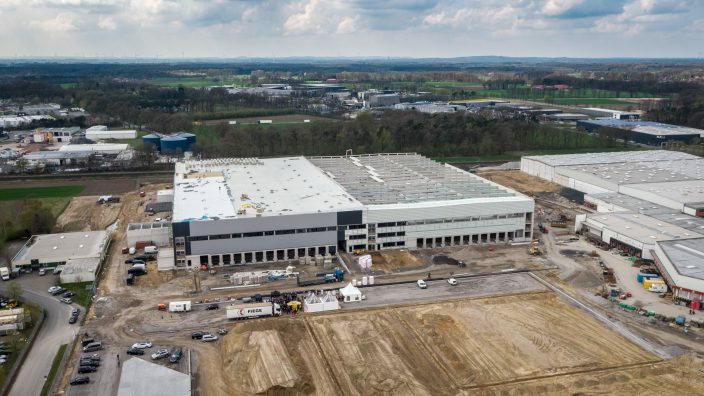 The new double-storey bays at the construction site reach far into the sky: The extension and upgrade of what used to be the head office of the Fiege Group is advancing nicely. 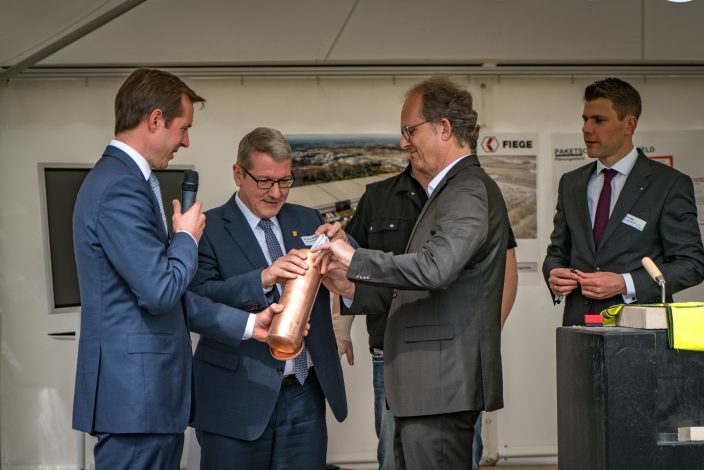 On Monday, 16th April 2018, Fiege celebrated the laying of the foundation stone at the new location in Greven-Reckenfeld, from where the Westphalia-based logistics company will be handling MediaMarktSaturn’s e-business operations. 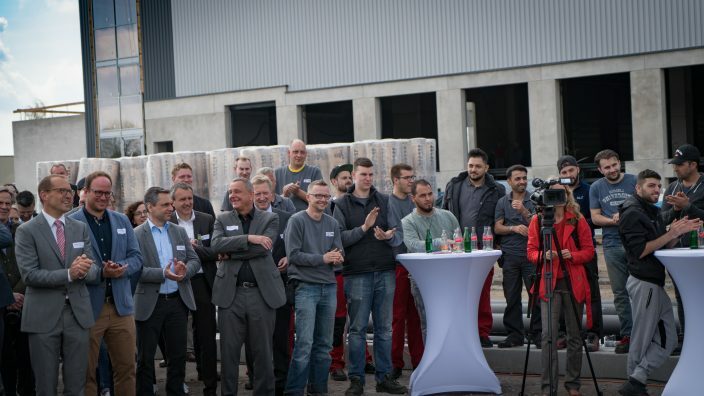 “This is a beacon project directly on our doorstep”, said Managing Board member, Felix Fiege during his welcome address, in which he described the intense emotionality associated with the construction project in Greven: “This is a matter which is very close to our hearts.” Following extensive refurbishments and expansion work, Fiege will render services for MediaMarktSaturn and other existing accounts on 90,000 square metres of space dedicated to logistics. “Some clients have been loyal to us for a long time, like Bierbaum-Proenen, Gröning, Bischof und Klein, or Claas. We owe them just as much gratitude as we do our employees, who have been working here with great success for years, thereby convincing our client MediaMarktSaturn of the value of this location”, said Felix Fiege. Before the 2018 winter sales season kicks in, two of the three new bays must be completed to meet the deadline for the first parcels for MediaMarktSaturn to leave the eCommerce location. Construction is still progressing according to plan, despite “plenty of water from underground due to issues with the groundwater, and from above ground due to the rain, and at times even from the side, when it snows”, said Jens Fiege. 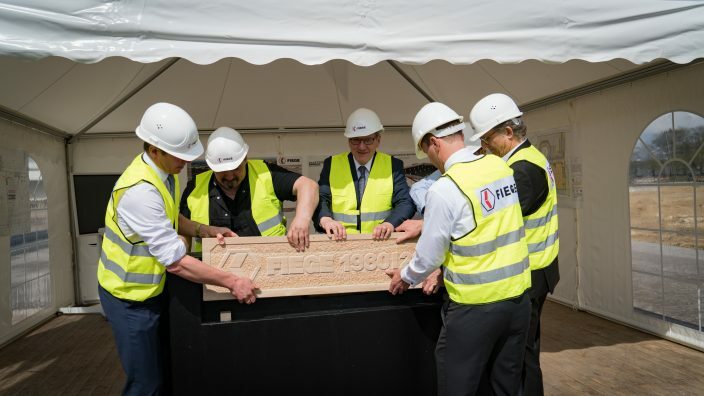 He therefore thanked especially those handling the construction: the Fiege Real Estate Development team; the construction company Köster, and the 100 construction workers, surveyors, civil engineers, architects and experts as well as many the other partners, clients, investors and local authorities. At peak times, up to 300 people will be working at the construction site, to ensure the timely completion of the project.